And the Award for the 'Most Irritating' plant goes to ... The Golden Hop ! Given for its habit of strangling every one who walks down the garden, with its sticky, wavy tendrils, which seemingly grow like Triffids overnight. It lurks on trellis, waiting and wafting gently n the breeze, to catch an unsuspecting visitor by the throat. 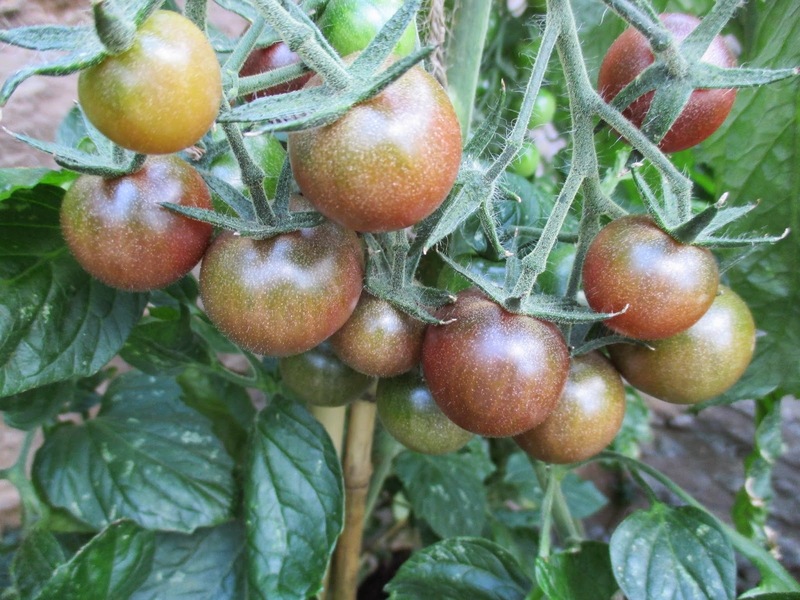 The next Award is for the 'Most Unappetising' plant , and the winner is .... 'Black Cherry Tomatoes'. Sorry, but they just don't look like food. They are extremely attractive, and look lovely on the vine, but I just have no desire to put them in my mouth. The third Hoehoegrow Award goes to the 'Most heart meltingly beautiful' plant, and this year there is a outstanding winner. English rose 'Jude The Obscure', whose subtle beauty is matched only by its fantastic fragrance. Honest, no sarcasm, it is just gorgeous ! It was hard to choose a winner for the next category, as there were many contenders, but in the end, the Award for 'Hardest Working' plant just had to go to 'Cosmos'. 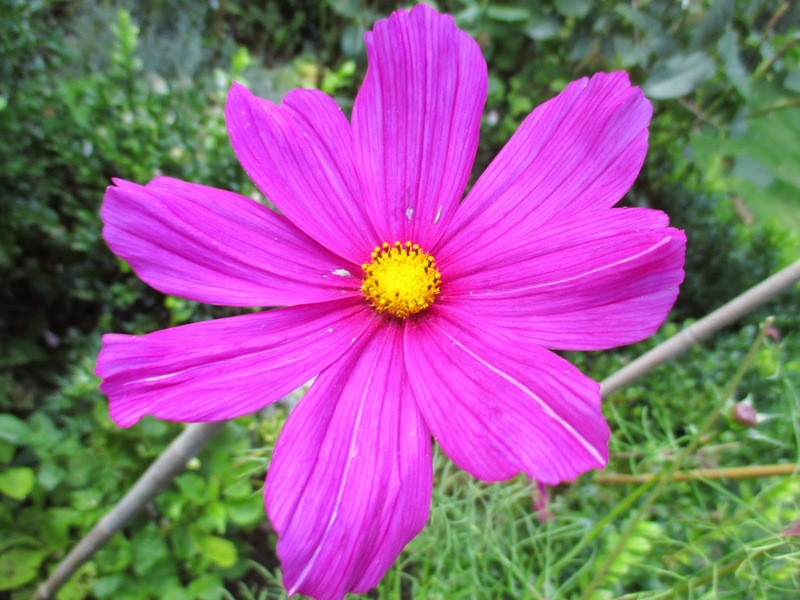 Grown from seed , Cosmos has been in flower non stop from May, and won't stop until the frosts come. Not only that, but wonderful foliage too. Always good natured, and eager to please, flourishing in all areas of the garden. A well deserved win. The following category for 'Worst Specimen Plant' had only one contender, so the winner was easy to select. Oh, 'Reine des Violettes' what went wrong ? I'm sad to say that you will be stripped of your title in Autumn, as you will not longer qualify, because you will not be a specimen plant, but will be banished to the back of the border. Our next Award is always an interesting one, as contenders change all the time, but the winner of the 'Best comeback' category is ... the Pumpkin ! From a very slow, sickly start this plant has gained health and vigour over the last few weeks, and now is growing what could become a very respectably sized Hallowe'en pumpkin . At one time it looked as if this plant actually would wither and die, but it came back from the very brink, to be the healthy specimen it is today. 'Sweet Rocket is the next worthy Award winner, for being the 'Best Germinator'. Grown from seed for the very first time, it germinated well, and very quickly. Seedlings are sturdy and grew on well, even taking patchy watering in their stride. We have a new category this year, which is 'Laciest Leaves', and there is an outright winner - the Hosta ! As you can see, those leaves are the laciest in town, and for that we can thank all the slugs and snails which have worked tirelessly to create them. They have even worked throughout the night to finish their creations. 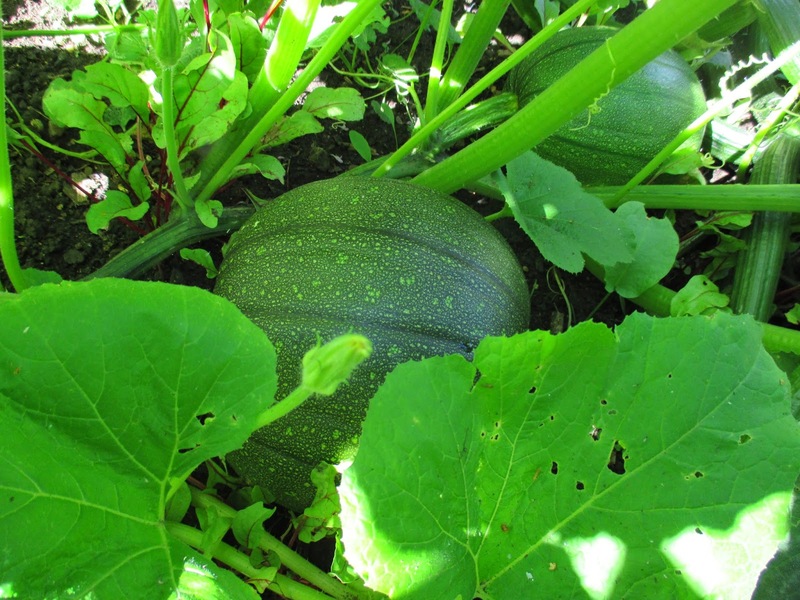 Their productivity has been amazing this year, as the garden is crammed with the laciest leaves imaginable. 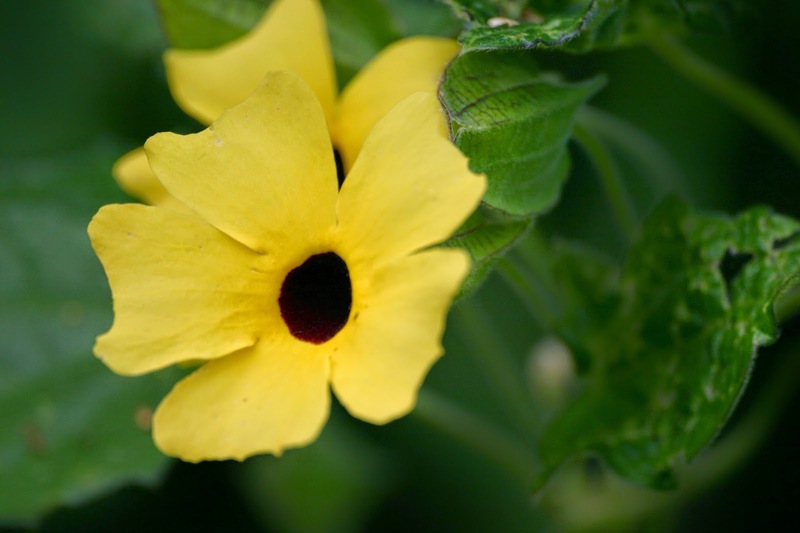 Our last category in the 'Hoehoegrow' Garden Awards of 2014 is 'Most Surprising ' plant, which has been won by the very unassuming ... 'Black - Eyed Susan'. Bought with bad grace, because it was the only annual climber left in the nursery, this plant has gone on to impress. It has stayed compact yet covered in flowers for months now. A very worthy winner, and a plant which will be returning to the garden next year. I hope you enjoyed the Awards, and I welcome your personal nominations, have you any worthy winners in your garden this season ? Hi Beth, you're right , it is a good time to evaluate - I've sort of moved on from this season in my head already! I would agree with Jude, having only had mine a month or so she(/he?) has already proved invaluable and is about the only rose I can actually smell! I'd add to it Boscobel, another new arrival here. Stunning deep pink, it's still producing flowers with more buds to come. It's difficult to nominate a worst performer. 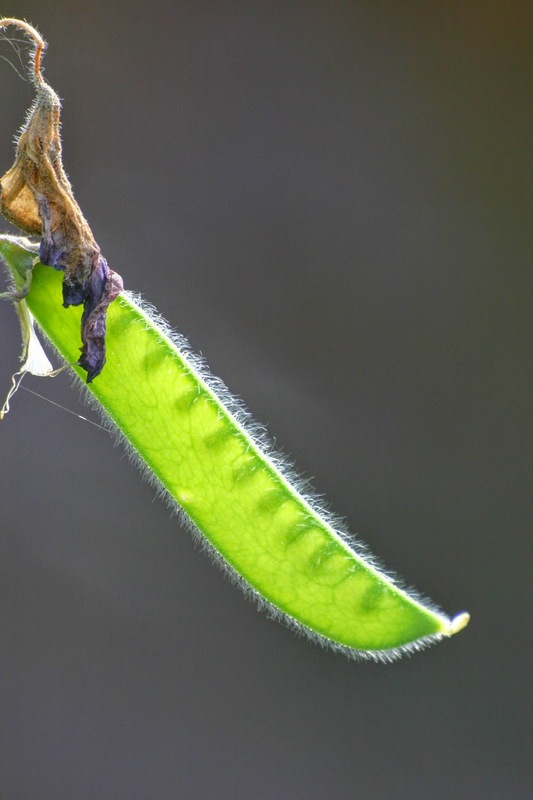 So much of what I grow gets eaten by something or other it's impossible to know how they might have done unhindered. I could instead go for most hated pest - the slug! Hi Jessica, I think the slugs would win the overall Award for 'Best performer' ! They have outperformed everything here this year! I have been thinking about getting Boscobel, and you may have just swayed me ! I'll have to try Black Eyed Susan. 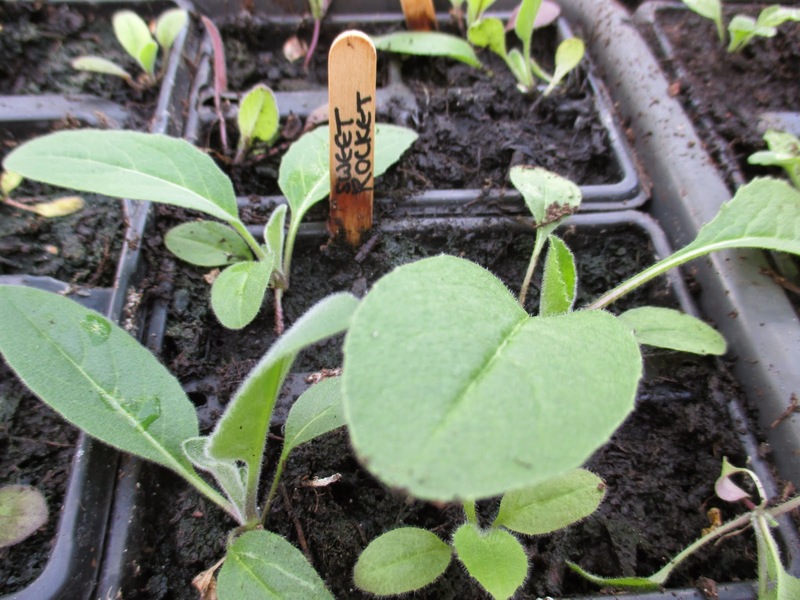 I've sown sweet rocket from seed too and ended up with dozens of plants. Hi Sue, I wasn't initially overjoyed with BE Susan, but I have warmed to it throughout the season because it has just been perfect! I think you have been a very fair judge and all the plants mentioned deserve their awards. The golden hop is also extremely difficult to dig up and it come up everywhere in my garden. La Reins des Violettes is supposed to be glorious but she rarely is. Like many Hybrid Perpetual she is prone to blackspot, so to the back of the border with her. My sweet peas have performed badly too. I thought it was because I didn' t pamper them enough. So they are also my most disappointing contenders. Oh hang on no, that accolade has to go to my cauliflowers. I would be embarrassed to show a photograph of them. You are right it is a good idea to assess things in August with a cool eye unclouded by sentiment. 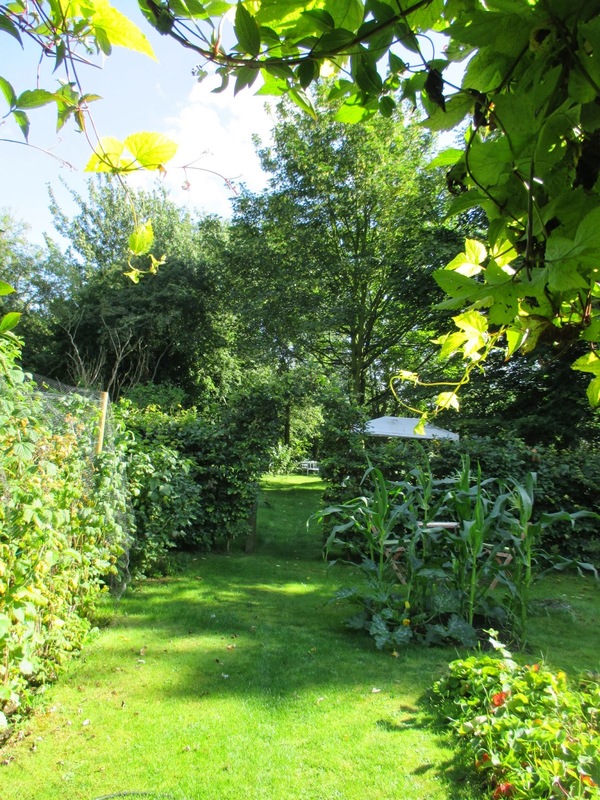 No cauliflowers in this garden next year. Hi Chloris , wonder why our sweet peas were not n seventh heaven with the perfect summer. What can have gone wrong ? Double award for most disappointing ! Thank you for a really entertaining post, Sweet Rocket is one of my favourite plants and I grow it every year from my own seed which is easy to harvest, planted out at the back end of Summer it always amazes me how large the plants become before flowering the following year. 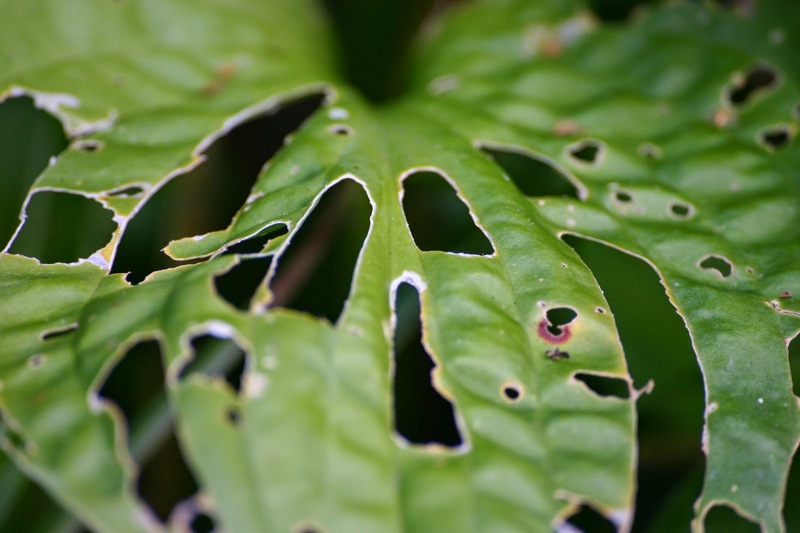 I have had terrible slug damage this year, many of my Hostas are as bad as your picture, but the things that have really been shredded are my Cardiocrinums (slugs and lily beetle) and Kirengeshoma palmata. I love this post! They deserve their awards. I really love your roses. I have never seen globe-shape roses here. So beautiful and gorgeous. Hi Endah. Quite a few of the David Austin English roses are globe shaped like that, and they are all gorgeous ! I loved this post, I kind of wish that you had opened it up to all of us gardeners...lol. My Golden hops takes home two awards, your first, and the laciest, raciest leaves... silly thing. Hi jen - please consider it opened up as I would love to hear your nominations ... Golden Hops seem to be gathering gongs like crazy! I loved this Jane, and would have to say that I agree with most of your awards. My sweetpeas are acting exactly the same, and yes, Cosmos has been wonderful as always - my award for bad behaviour goes to the grape vine in the greenhouse which pokes you in the eye every time you go in. I came across Jude the Obscure at Highgrove - the scent was truly delightful and is on my list of roses to buy next year together with Fantin Latour which is equally gorgeous. My dahlias have been the biggest disappointment this year they haven't stood a chance against the slugs despite all my efforts to thwart them. Oh well there's always next year - try try again! Hi Elaine, what is it with all these sweet peas ? I am actually reassured, as I thought it was just mine that were misbehaving! Fantin Letour is on my list too - is it a repeat bloomer ? Jude flowers fantastically and has an almost lemony scent. My dahlias have been ok - I think all the slugs headed straight for the hostas !! Your posts are always such fun.....and informative! I love your English rose! It's amazing. Your poor Hostas. Fortunately, it takes more than that to kill them. The Golden Hop reminds me of "Little Shop of Horrors"! Hi Flower Freak, aw thanks for that! 'Jude the Obscure' is a gorgeous rose - grow it f you can! Hi Jane, sadly I can only blame myself for the poor performance of my sweet peas. Too many planted too close together and then I got bored (!) of picking them. No wonder they have run to seed. Your Golden Hop award made me smile, I remember those tendrils all too well, but I do love the foliage. If I grew roses then 'Jude The Obscure' would become a must-have! My star performers have been the perennial wallflowers for, well, flowering perennially, and Stachys Byzantine, for being ridiculously easy to grow from seed, quickly becoming good size plants, and being so endlessly strokeable. The tomato Indigo Rose, on the other hand, has been a huge letdown. Never again! Hi Janet, I think your sweet peas must have been a success rather than a failure, if you had so many that you got bores of picking them ! I should have given my perennial wallflowers an award too, as they were fantastic. I don't know Stachys Byzantine, unless it used to be Stachys Lanata, in a previous life. It is 'lamb's ears' and VERY stroke able. My hosta is similar yours Jane. It's pity. And sweet pea is not yet in bloom. It's sad as well. So I have two winners in my garden! Hi Nadezda, what a coincidence ! Which plants would get your award for good performance ? Very entertaining post Jane and what a great idea to bestow your own awards on plants that fit in to the categories you've created! Hi mark & gaz - what would your nominees be ? Hi Tammy, thankyou ! I feel very privileged to be in your Blogger Spotlight ! That is a beautiful rose in color and form...and Black Cherry tomatoes are my favs in flavor...amazingly sweet and wonderful on the tongue. Hi Donna, 'Jude the Obscure' is such a romantic, fragrant rose . As for the tomatoes - I should eat them with my eyes closed, and concentrate on flavour and not visuals! 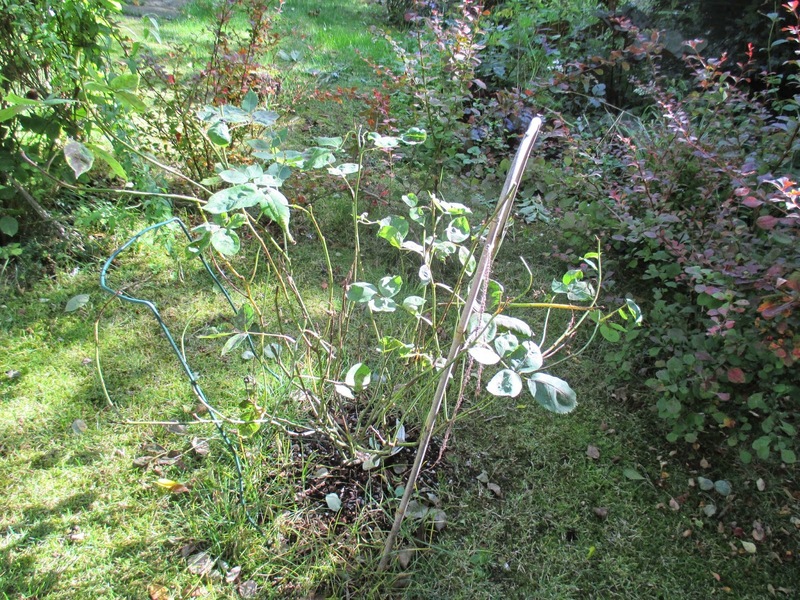 I have always wanted to try the Black-eyed Susan vine but was afraid that it might be invasive. I'm happy to hear that it isn't. Hi Phillip, it has been extremely well behaved in our English climate, but I don't know how it would be with you... hopefully the same ! It has been constantly in flower all summer long. Jude the Obsuce is a new comer to my garden. So much so it's still stuck in the pot but the scent coming from the buds is itself incredible, I can't wait until it is in full flower. Glad I am not the only one who thinks so too. The award in my garden for most laciest would have to go to the Kierengeshoma, it's now a sizeable plant and looks awful! Hi Angie, I have 'Wollerton Old Hall' and it is sposed to be one of the most highly scented but it doesn't compare to 'Jude'. Such a beauty too. Are you still deciding where to put it ? Mine has gone a bit berserk and has grown strongly this season, so allow lots of space for yours, wherever it goes ! Hi Michelle, what is it about sweet peas this year ? I just assumed everyone else was having a cracking season with them, but it would appear not ... Let me know about your other Award winners ! 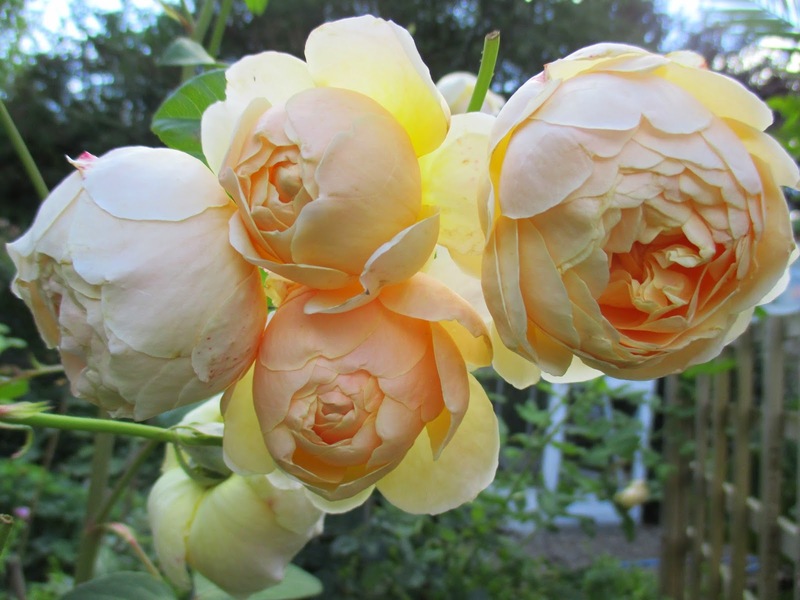 My "Comeback Kid" has to be the delicate, understated HT rose "Mrs. E.G. Hill". Due to newbie pruning (um....), a horrific -15º winter (that's NEGATIVE), and shocking 106º summer, she looked as if she had been told that E.G. was leaving her and and taking the cat. I coaxed, wheedled, kvetched and sang to her, but by the beginning of July--despite gentle organic fertilizer applications, purified water, and a visit from the priest--I wrote her off and let the weeds grow around her. Then, pulling them last week, ta-DAAAA! A perfect bloom, more on the way, and new growth everywhere. Who knew that neglect was a serious garden remedy?! Wish I could post a picture...she deserves accolades. We've had a golden hop plant win our "Most Irritating" award, too. My brilliant husband planted one that shot up to the second story, ensnaring cats, kids and chickens, who insisted they lay eggs in its nastiness. Sticky, prickly, a jungle for bugs like our terrifying praying mantises (just try working anywhere around it without finding the monsters in your hair...yuck!). It didn't smell good. It didn't look good. And it made a large part of our old garden unusable. Like the movie Terminator says, "It can't be bargained with, it can't be reasoned with--It doesn't feel pain or pity or remorse. And it absolutely will not stop until you are dead". Yearly, its sticky, stinky tendrils would snake up our house--up two-plus stories--and clog the drains. Never, never again. So know, Jane, that I feel your pain! Did your 'Reine des Violettes' get enough sun? It looks leggy. Hi Lynne, congratulations to Mrs E G Hill, who rose, phoenix-like from near death! Sometimes, just like with your kids, ignoring them can be the best strategy! I'm glad I am not alone in being strangled by the Golden Hop, and I am pleased to say we do not have praying mantises here ... if we did I would have to move. Even the thought of them makes me go a bit wobbly! If we have bugs in it then they are cute and cuddly, like ladybirds ! !